These three garden beauties are made with fresh kale, oregano & basil, and walnut & parsley. Pesto sauces are perfect for a simple dinner on a hot summer day or a quick snack. You can make the sauce quickly right before your meal or prepare ahead of time and store it in the refrigerator. Before dinner, set your pesto out to come to room temperature while cooking 16 oz. of pasta. Toss the pasta and pesto with 1/4-1/2 cup of the pasta cooking water to create a pasta sauce. 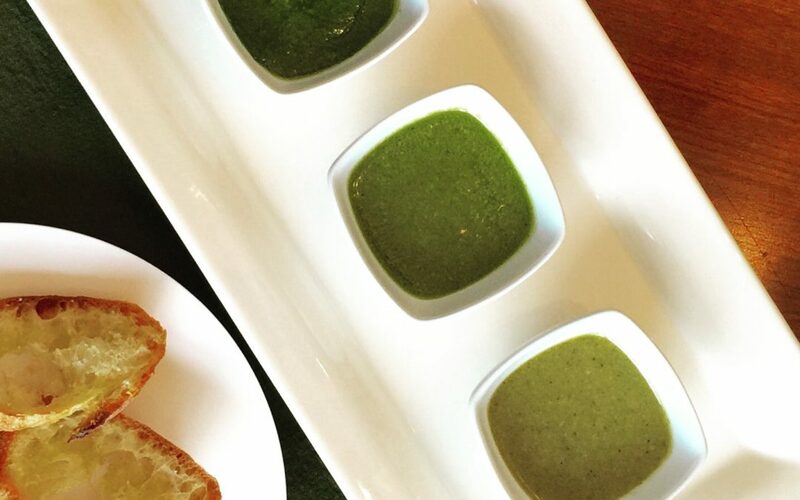 Or as a snack, just toast some bread and serve your pesto as a dipping sauce. Below are three lists of ingredients. The instructions appear after the ingredients and are the same for all three. Start by toasting the nuts in the oven – at 350 degrees for 10 minutes. Watch the last couple minutes very carefully so they don’t burn. Follow the same directions for all three pesto sauces listed below the ingredients. Place all ingredients into a blender container or food processor in the order listed and secure top. Process, stopping if necessary to scrape down the sides or press the ingredients into the blades. Pulse until you have the consistency you want. If your pesto is too thick, drizzle in a little olive oil, one tablespoon at a time until you reaches the desired consistency.